Sarah Reardon is the maker and pattern designer for The Burgundy Box. 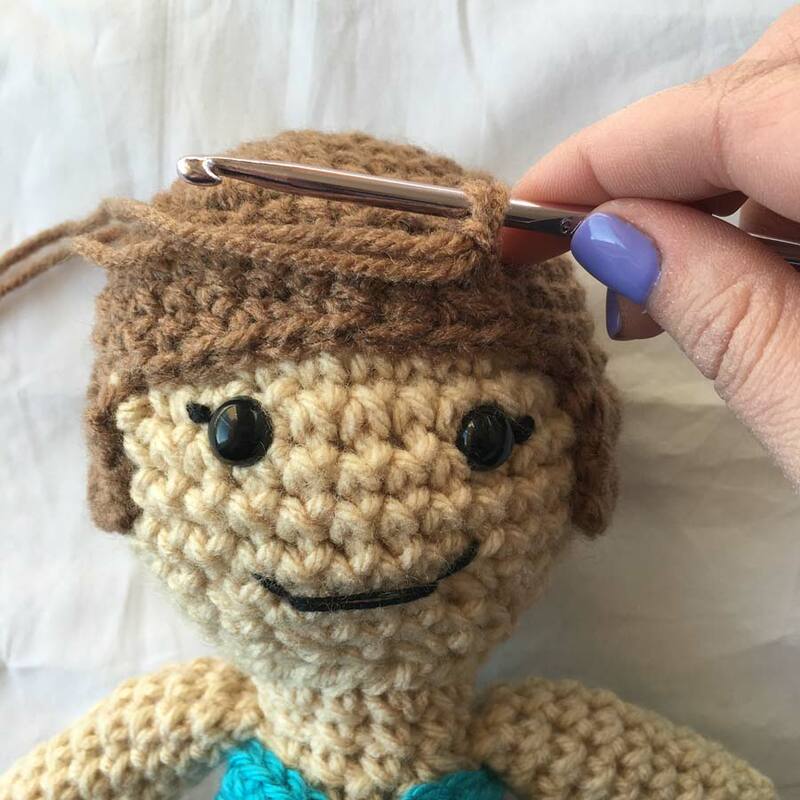 There’s nothing she loves more than creating original projects with yarn, but if you find her without a hook in her hand, she’ll have her nose in a book and a hot cup of tea instead! While she loves to create, her favorite thing about being a maker is getting to be a part of the maker community where she gets to help inspire and share with other makers across the globe. 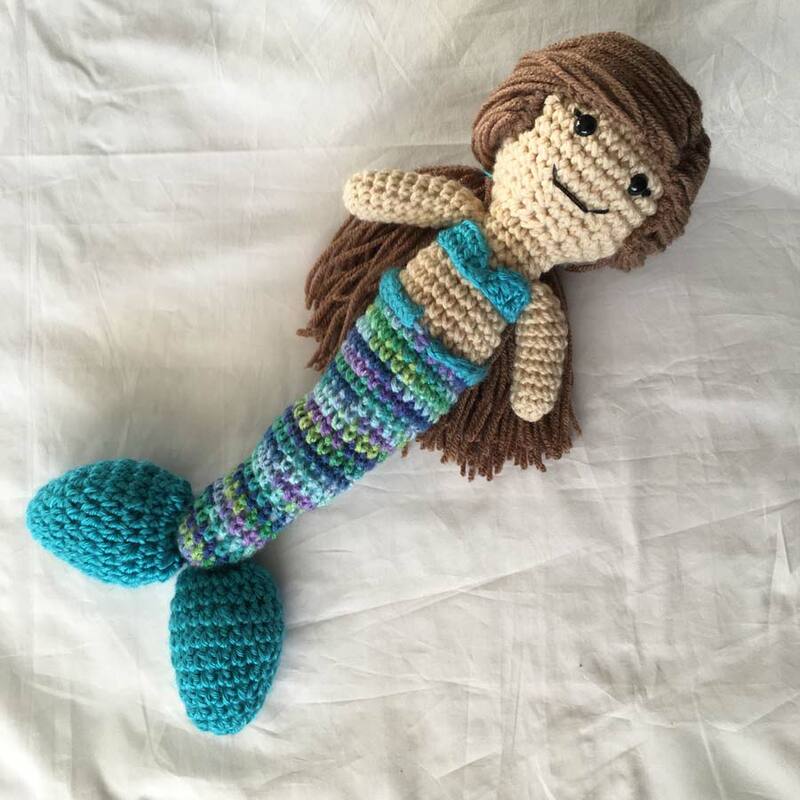 This mermaid pattern is fun to make, and can be customized to look just like your little one! 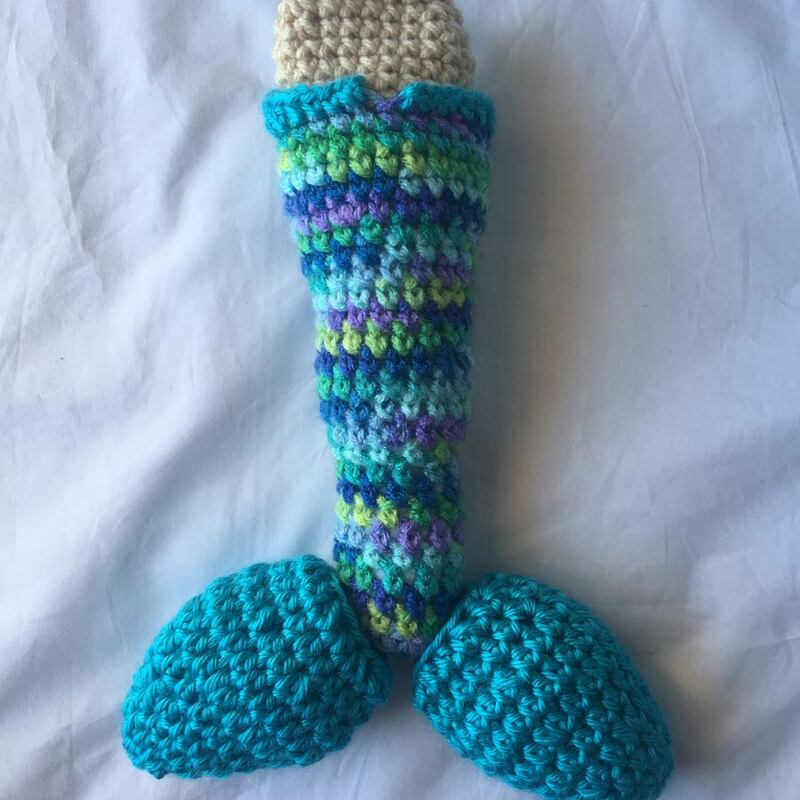 The finished product is 16 inches long, and super soft and cuddly! Worsted weight yarn in 5 colors. The designs with this pattern are endless! It can all change depending on the look you’d like your doll to have. You’ll need a color chosen for the following parts of the doll: a Body color, Tail color, Fin color, and Hair color. -Please note that this pattern is worked in rounds. -You will not be chaining one at the end of a row unless specified. -When you finish each piece of the doll, they will not be closed pieces. -The pieces are closed when you sew them together to form the doll. -Stitch counts will be in parentheses at the end of each step. -Please be sure to move your stitch marker into the first stitch of each new row. -Safety Eyes are listed in the materials list but are not necessary. 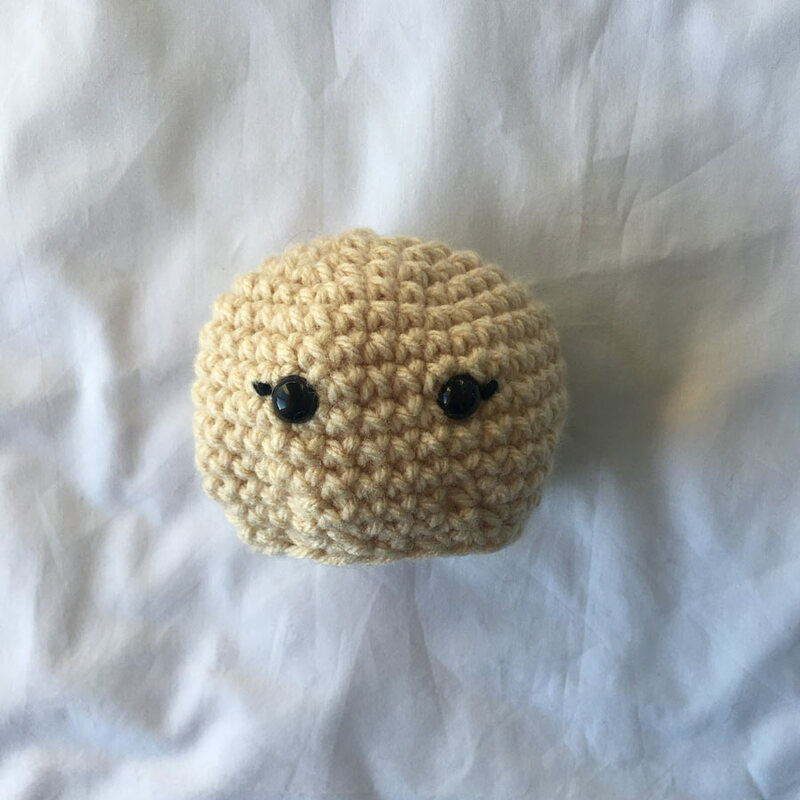 -The eyes can be made with the embroidery floss too if you’d like. It all depends on personal preference, and the look you would like the doll to have. 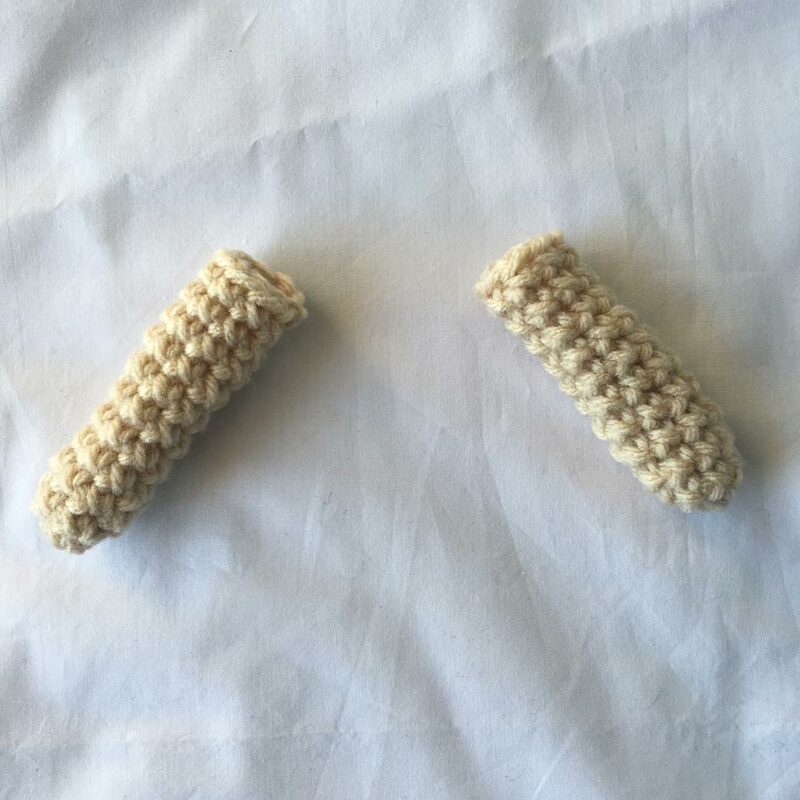 -When sewing the pattern together, I use yarn and the yarn needle for the most durable stitch. 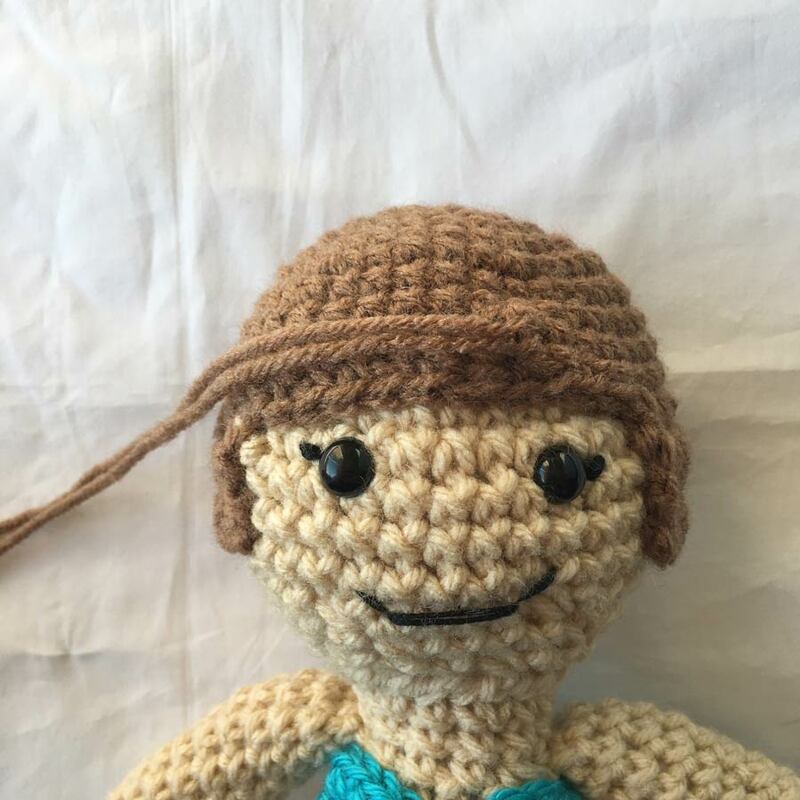 Once you have completed round 12, you can either insert the safety eyes of the doll or sew on the eyes with embroidery floss midway through row 10. Eyes should sit about four stitches apart. Also sew on eyelashes at this point before continuing to the next step if you would like. 16. 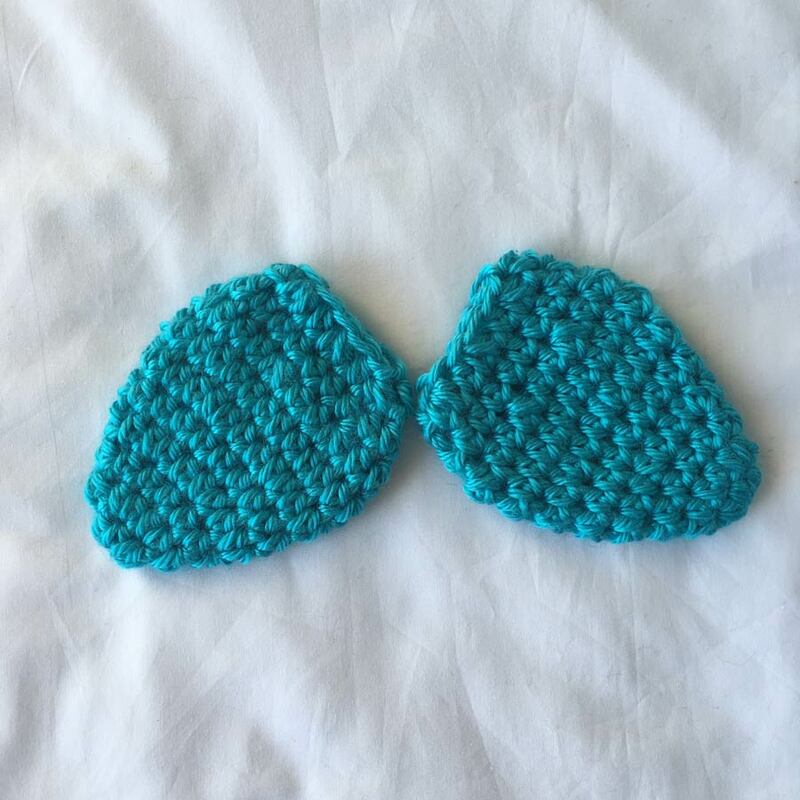 Sew on a mouth for the doll with embroidery floss between rows 12 and 13. 16. 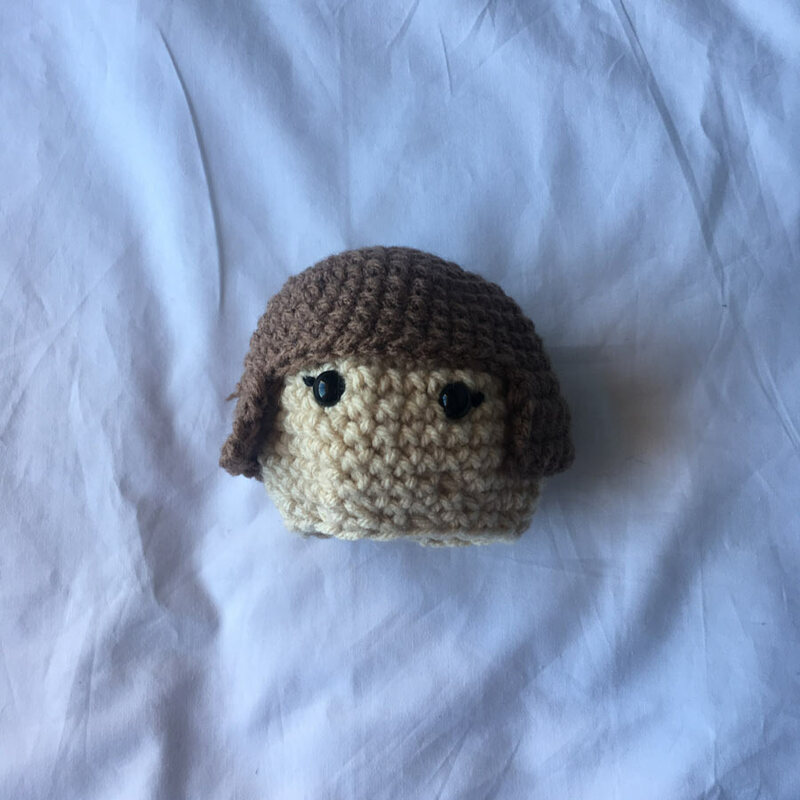 Position hair cap on doll and sew to head. Stuff head with polyfil. Working from round 29 of body, work in FLO. Fasten on in Fin color yarn in 13th stitch in round. SC in first four stitches. Then HDC in next two stitches. DBC in next twelve stitches. HDC in next two, then SC in last four. Fasten off and weave in ends. Do not join to first stitch. Sew fins onto end of tail. One should be on either side of the doll. The break in the waist band shows the center of the doll, use this as a guide for fin placement. Attach arms to both sides of the body as well. Sew the tops of the arms onto row 38 of body. 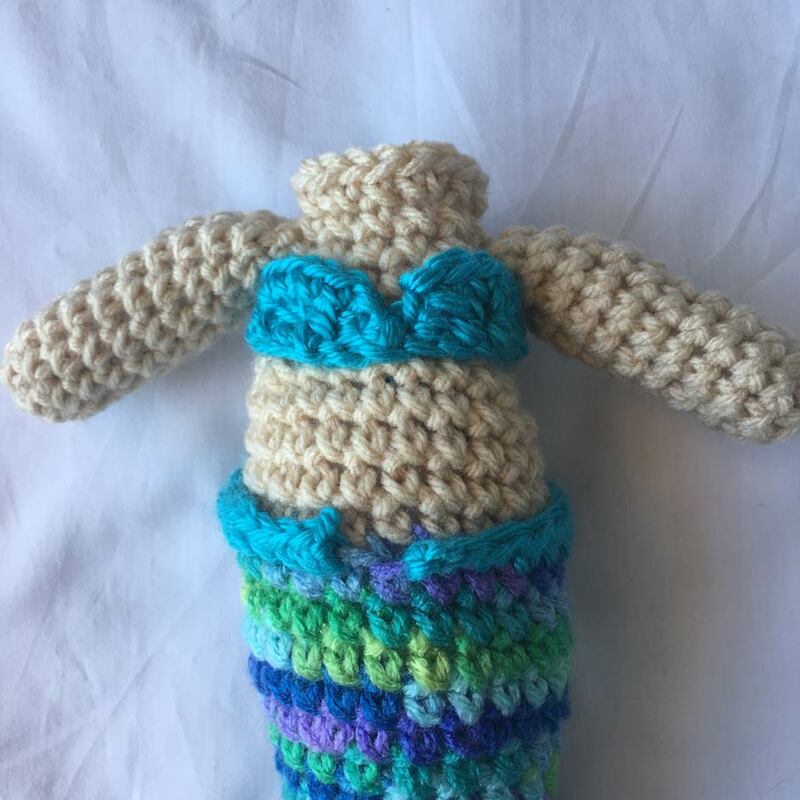 Place Mermaid top on body. Make sure the arms are outside of the top. Make sure sweetheart neckline of top is centered by lining it up with the waistband. Secure in place by sewing. Stuff the body of the doll with polyfil. 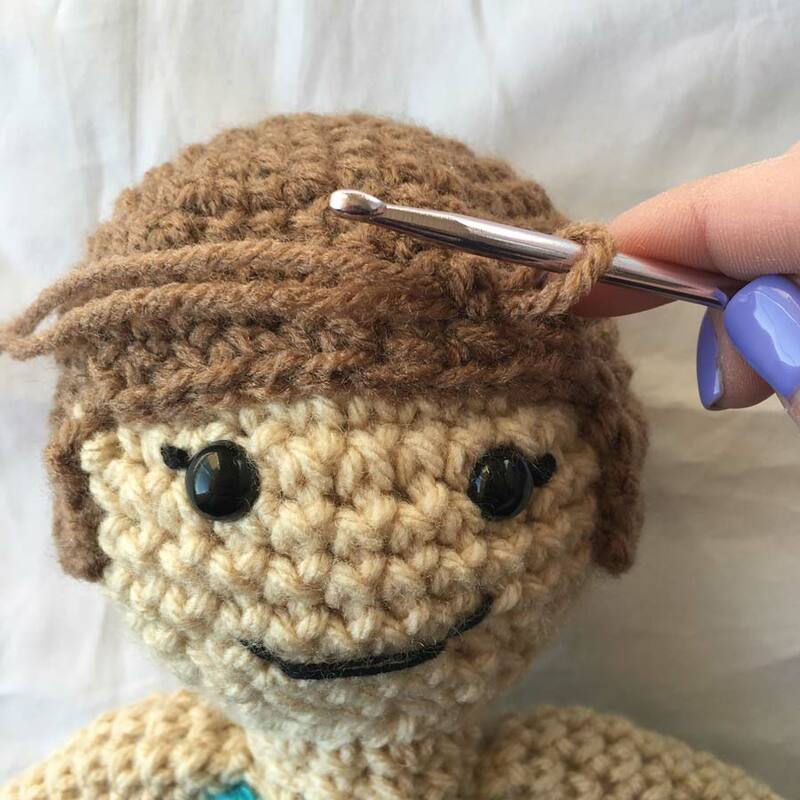 Do not over stuff so that as you sew on the head of the doll the stuffing won’t get pulled through the stitches. (As you see around the head you can add more stuffing in the neck area of the doll). Sew head onto body. 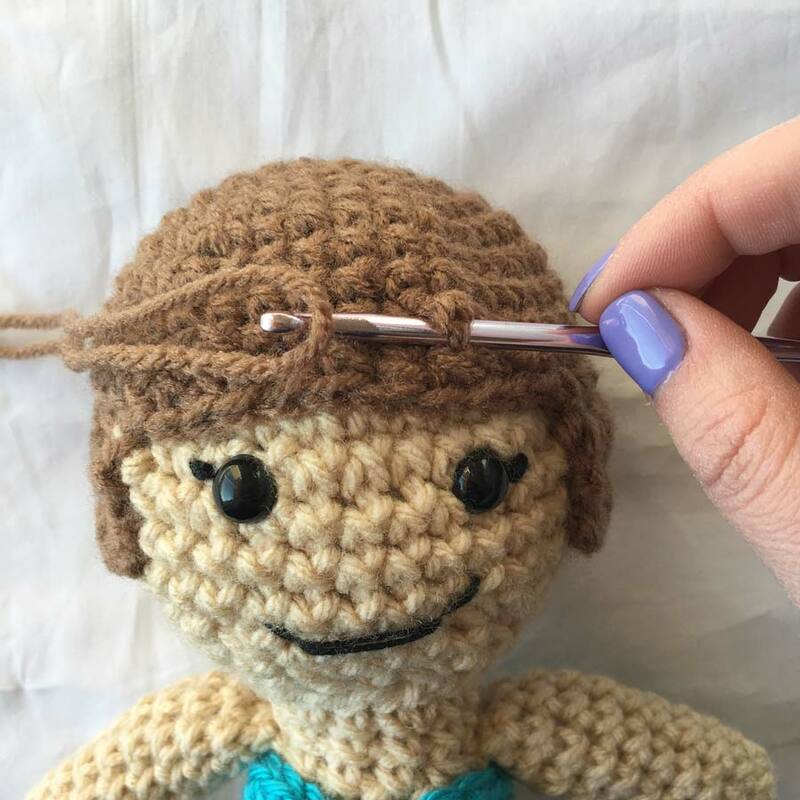 Secure head in place and centered over the body with a stitch marker to make sure the head does not shift as you are sewing. 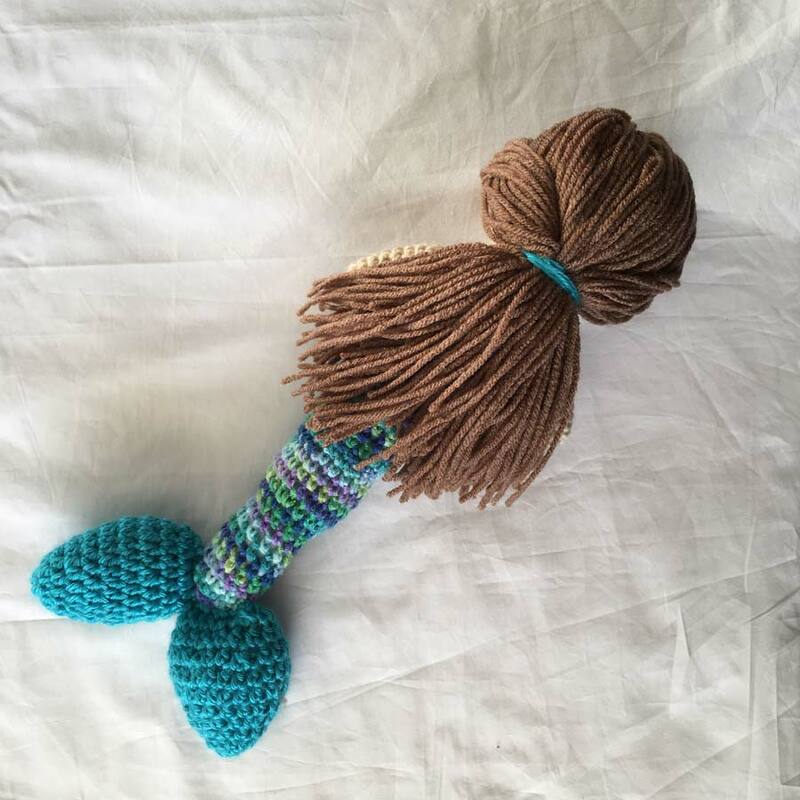 While any technique you like can be used for the hair of the doll, my favorite method is weaving in the hair piece by piece. This gives the doll a nice full head of hair and good coverage over the head. To begin: Select a length for your doll’s hair. Make sure the length of the strands you cut are twice that length, as the pieces of yarn will be folded in half to be woven in. Now select the placement of the part of the hair. I like to part the doll’s hair just above one of the eyes. Insert your 3.75mm hook in between the stitches where you are starting your part. Take cut yarn, fold in half and hook onto your hook. Pull the loop of yarn through. of the yarn on the other side of the stitch and pull through. This will secure the hair strand onto the doll. Repeat this process in a straight line going back on the hair cap, until you reach the center of it. That’s where your part should stop. Repeat this again going from the next row behind the first weave and go straight back. 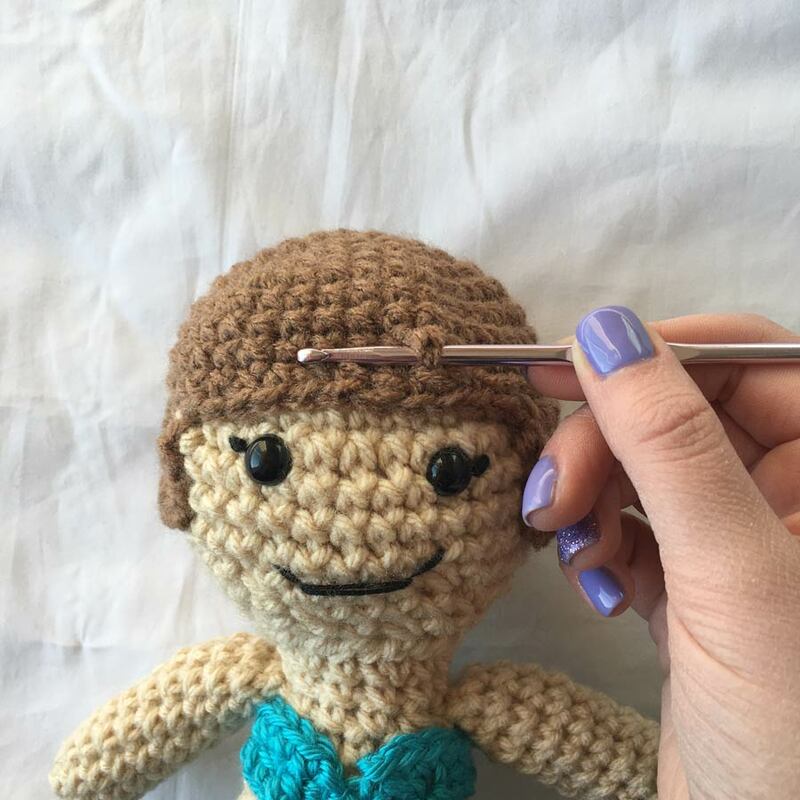 Do this process for both sides of the part, but insert your hook in the direction you would like the hair to fall. Repeat this process with one row of weaves along the entire edge of the hair cap. Fill in hair on the back of the head where needed (usually directly under the part). Like the place where you weaved in hair for the part, do two rows of hair weaves here. You do not have to weave hair over the entirety of the head, unless you would like the mermaid’s hair to be down and not in a ponytail. 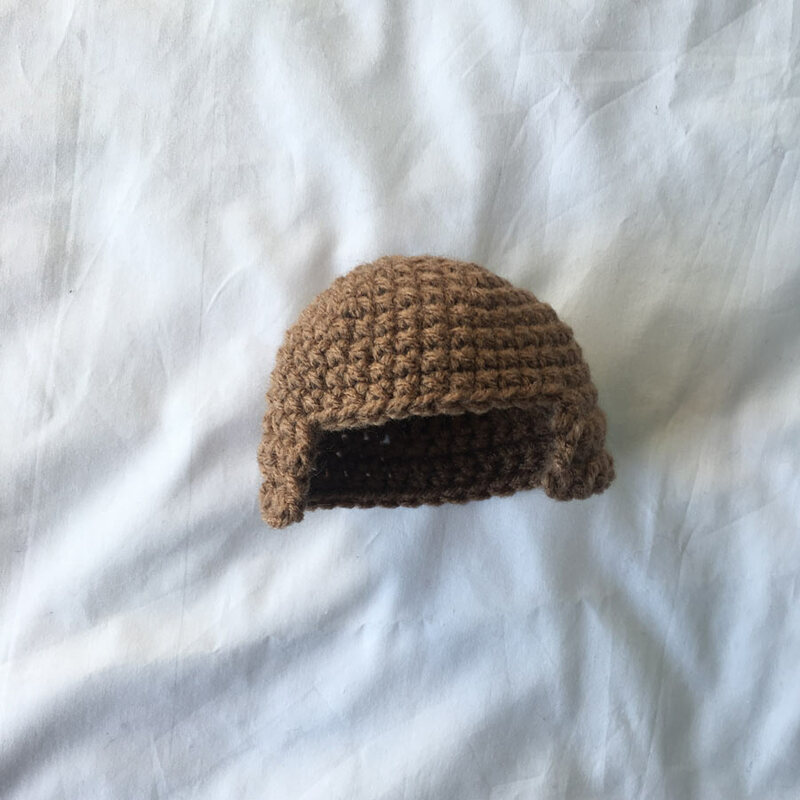 If that is the case, then weave 1 row of hair around head (once parts are done) every other row of stitches on the hair cap. To put hair into a ponytail: take the front pieces on each side of the hair and do a slight twist. This will add a fun fancy effect to the pony. Use a clear elastic to hold hair into pony. 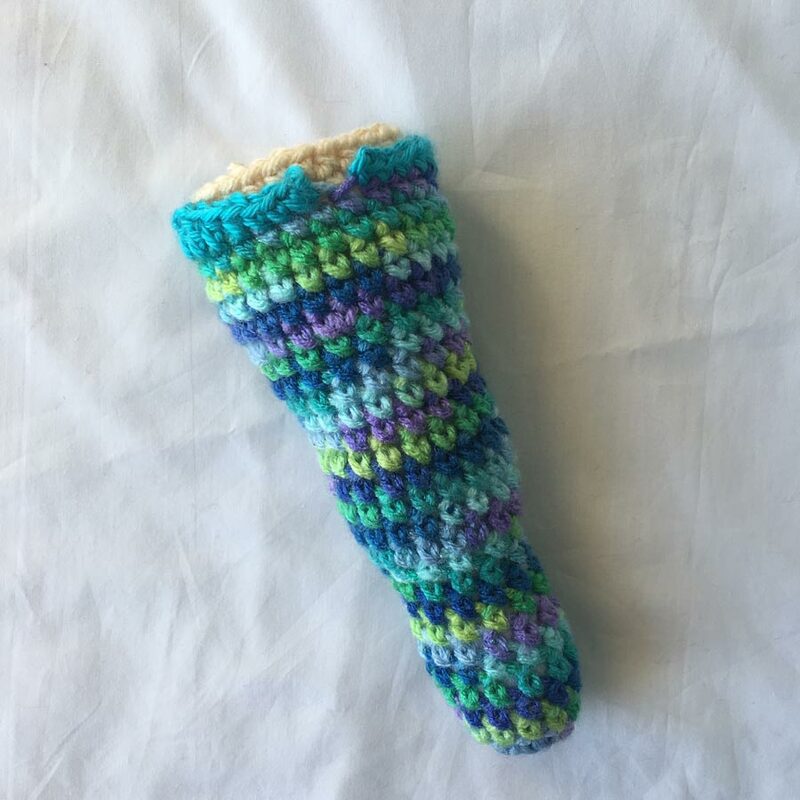 Then using the yarn color you used for the fins, cut a strand of yarn about 5 inches long and tie securely with two knots around the outside of the elastic. Take one end of the yarn and wrap around the hair, covering the elastic. 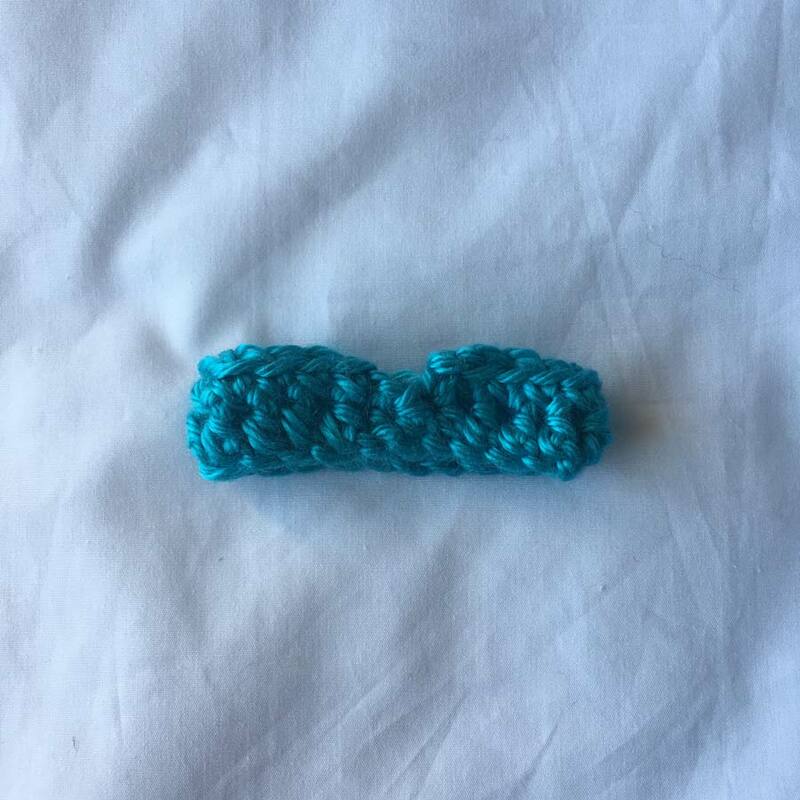 At the end of the yarn, using the 3.75mm hook pull the left over fin colored yarn into the center of the ponytail. Repeat with the other strand from the knot. Trim the end of the hair if necessary so the strands are even. And there you have it! 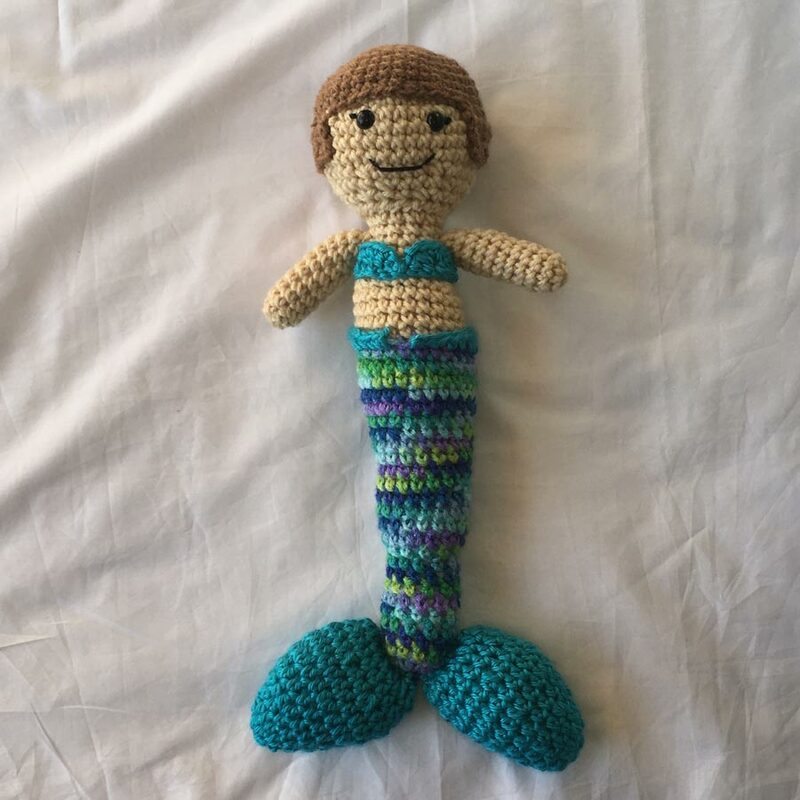 You have successfully finished making your Meghara Mermaid doll! I hope you have enjoyed this pattern as much as I have loved writing it! If you're interested in more patterns or more of my work, you can find me on instagram or on Etsy I'd love to see what you've made from this pattern, so please tag me on instagram! It was a pleasure to share this pattern with you.